Spux e-mailed me last weekend while vacationing in Florida. He wanted my snail mail address so he could "send me a postcard". He figured it wouldn't get to me before he got back but he wanted to send it anyway. When I saw him Friday night he asked quietly, "You get your postcard yet?" I should have checked my mail yesterday but I didn't. So, this afternoon, while I was out of the house and unavailable, a strange thread started by my upstairs neighbors appeared on my Facebook page...something about coconuts...I was perplexed. What in tarnation are they talking about?! #himself: Jane, do you know about the coconut? #himself: The coconut, Jane. Do you know? #himself: Because it knows. And it's waiting for you. modchen: it's got three eyes. #himself: Blank timeless face like Easter Island visages. The coconut. modchen: It's waiting for Jane. modchen: It's listening. Don't anger it. #himself: It lived in a black metal box. But then it got out. #himself: Now it's on the floor. Now it wants more. This went on. And on. And on. Frankly, it started to creep me out a little. Some days I can be so dense. Finally it occurred to me...they were talking about my mailbox. I had new [snail] mail. Spux's idea of a postcard. Somehow he knew I not only needed a coconut bra but an entire coconut to feel better. 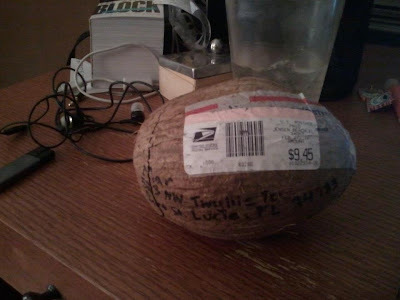 I'm also fairly certain Spux is the only person on the planet who would think to slap a postage stamp on an unwrapped coconut and send it knowing the presentation would be just that much better. Thanks, Spux. It worked. I <3 your face. LOL! I saw the Facebook thread and assumed it was some kind of inside joke, though I did immediately think of the coconut bra. You have the coolest friends! Everyone needs a Spux-sent coconut in their lives, once in a while. I sure like his style! You do have some wonderfully crazy friends. I have a friend who made a bacon bra. Wish I were half as creative as you and your wonderful friends! Love the coconut postcard. And the string of Facebook comments you quoted. Too fun!! !